"Blackhawk Chassis Straightening with Automatic Measuring System"
Our Core focus is on customer satisfaction. We pride ourselves on quality workmanship. Because of our commitment, we enjoy a strong and loyal customer base. Mechanical repairs, Auto electrical,Ttyres & Wheel Alignment, Glass Repairs & Replacement, Graphics, Vehicle Valet and Upholstery Repairs. Richard Benn, the company Director completed is Trade Qualified and has 28 years experience of on the job experience. 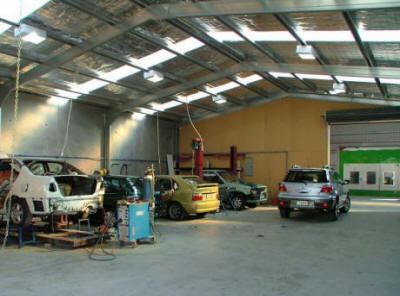 Richard is well versed in all aspects of repairs from small rust jobs to large smash and structural repairs. Our customers value the high standards Richard has set for both himself and his staff. He believes customer satisfaction to be a major key to the success and long term future of the company. We look forward to assisting you with your repairs.